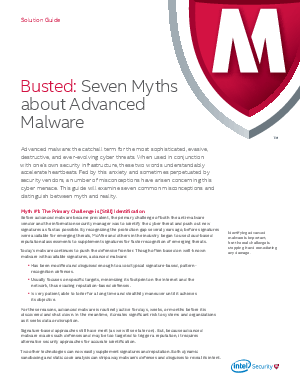 Advanced malware is the catchall term for the most sophisticated, evasive, destructive, and ever-evolving cyber threats. Fed by lack of understanding and anxiety and sometimes perpetuated by security vendors - a number of misconceptions have arisen concerning this cyber menace. This guide will examine seven common misconceptions and distinguish between myth and reality.